It’s all hands on tech when Everett Program students host an “impactathon,” a hackathon-style event, intending to make a social difference. A part of the UC Santa Cruz sociology program, the Everett Program merges the enthusiasm of student leaders with information technology to promote social change by building social networking capacity across non-governmental and community-based organizations. A group of students recently spent the weekend collaborating with Motivating Individual Leadership for Public Advancement (MILPA), a nonprofit in Salinas dedicated to youth empowerment. The weekend was modelled after a hackathon, an event that brings together computer programmers, developers, designers, coders, and others to work together in a condensed timeframe to create usable software. Instead of focusing on technology, Everett’s impactathon aligns to the program’s mission of empowering people to develop practical solutions to persistent problems. Six students met up with 30 MILPA youth volunteers, which included middle schoolers, high schoolers, and community college students, at the organization’s Salinas office to create a set of educational materials that would amplify MILPA “schools not prisons” message to voters. In two short days, the group created a set of infographics, posters, and even door hangers to raise awareness about who California sends to prison, what the cost is to taxpayers, and how that affects investments in education, health and other community needs. California’s incarceration problem and the school-to-prison pipeline is a personal issue at MILPA. Some of the organization’s staff members are transitioning back into the community after spending their childhood and adult lives incarcerated or in a detention system, while others were once considered at-risk youths themselves. They have seen the prison problem first hand and want to make a difference. For MILPA co-founder John Pineda, youth involvement in the political process is vital step towards mobilizing change. Raising awareness about how legislation impacts young people's lives is one way to connect them to the political system, he said. The impactathon not only highlighted the different ways problems can be presented, it also gave local youth the opportunity to talk in their own voice about problems they experience. “Young people are never brought to the table to discuss how they are feeling,” said Pineda. His 13-year-old daughter, Jennifer, participated in the impactathon and even created her own infographic that questions why the state allocates more money to prisons than to preventative measures like early childhood education. Impactathons are also an opportunity to demystify technology in a fun and engaging way, said Ongjoco. During the first part of the program, MILPA volunteers learned about graphic design and how to use open-source infographic makers. The second half focused on learning by doing and team workshops. “It was amazing to see the progress people made, of all ages and tech experiences,” Ongjoco said. 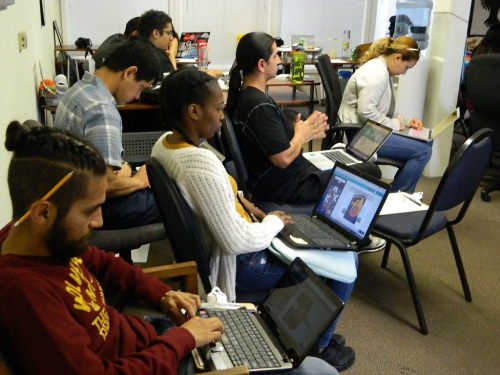 Everett Program students also supplied loaner laptops for MILPA volunteers to use. “There is still a digital divide,” said Pineda. He also pointed out that there is also not just a lack of resources but also a gap in equity and education. “Just the term graphic design seems so foreign, that only certain people can access,” he said. For the youth he works with, doing graphic design was something they never thought they could do. Thanks to working with Everett Program students, now they can. “It was so cool seeing them put their designs on their school binders,” said Pineda. “Our community partners are finding them to be a great opportunity to not only move forward very specific projects, but also expand their own technology capacities,” said Everett Program director Chris Benner. This is the second impactathon the Everett Program has organized. The first was to create graphic design collateral for No Place Like Home, a project on the Santa Cruz housing crisis organized by sociology professors Steve McKay and Miriam Greenberg.